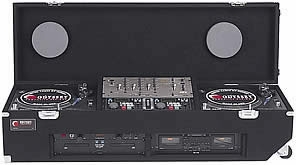 Odyssey CDJ19R06W Turntable Combo Coffin w/ Wheels DJParts - All Variety of Parts that DJ Needs. The carpeted DJ coffin holds two turntables and features recessed hardware. The center rackmount section holds a 19 mixer and has a 3U x 2 vertical rack space for CD players, amps or other hardware. Capacity: 19 mixer. Has wheels for easy transportation. Dealers: this item ships via truck only.